In her phenomenal baking book in which this recipe is found, Kim Laidlaw attributes the inspiration for these raspberry linzer bars to Sugar Mama’s Bakeshop in Austin, Texas. Suffice it to say it’s on our list of places to try next time we’re helping to keep things weird in Austin. 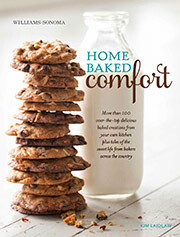 And if you haven’t bought yourself a copy of Home Baked Comfort, let us assure you, you won’t have any regrets for this impulse purchase. Nor will your friends and family. 1. Position a rack in the middle of the oven and preheat to 350°F (180°C). Line a 9-by-13-inch baking dish or two 8-inch baking dishes with parchment paper. 2. In a bowl, combine the flour, granulated and brown sugars, salt, and lemon zest. Add the butter and, using a food processor, pastry blender, or 2 table knives, quickly cut the butter into the flour mixture until the butter is the size of small peas. 3. Pat about 3/4 of the crust mixture over the bottom and slightly up the sides of the prepared pans, pressing firmly to make an even layer. Bake until the crust is pale golden brown, 30 to 35 minutes. Cover the remaining 1/4 crust mixture remaining in the bowl and refrigerate it. 4. Set the crust aside to cool while you make the filling. 5. In a saucepan, stir together the raspberries, granulated sugar, and cornstarch. Simmer over medium heat, stirring often, until the sugar dissolves and the berries are juicy but not completely broken down, about 2 minutes. Remove from the heat and let cool. 6. Spread the filling over the partially baked crust. Crumble the remaining chilled crust mixture over the filling. Bake until pale golden and bubbly, about 25 minutes. Let cool completely in the pan on a wire rack. 7. In a bowl, combine the confectioners’ sugar, cream, and almond extract. Whisk the ingredients together until combined. Fit a piping bag with a small, plain tip, and fill it with the glaze or pour the glaze into a large resealable plastic bag and snip off the tip of one of the bottom corners. Pipe or drizzle the glaze over the linzer bars in a crisscross pattern. Refrigerate until chilled through, at least 1 hour. Cut into bars. Linzer Bars Recipe © 2014 Raspberry Linzer Bars. Photo © 2014 Eric Wolfinger. All rights reserved. All recipes and photos used with permission of the publisher. These raspberry linzer bars are truly delicious. Not too sweet and quite delicious. Instead of using a pastry blender, I used my food processor and pulsed the crust mixture. That worked better for me than doing it manually. Make sure the butter is chilled well! I put my cubes in the freezer for a bit just to make sure. During my first batch, I found the raspberry mixture to be quite liquid. I believe that was due to having washed the raspberries shortly before using them. The second go-around I washed the raspberries the day before and let them dry on paper towels and that worked better for me. 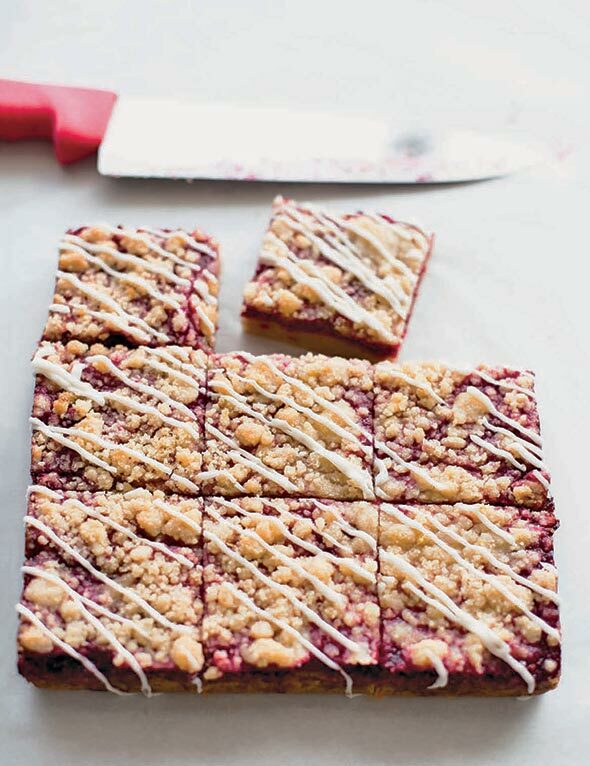 These raspberry linzer bars are an enjoyable little treat for any and all occasions. They are fruity, light, satisfying, and pretty enough for a special occasion but an ideal little treat to go with a casual cup of coffee or tea. They are not overpoweringly sweet or heavy. 3 sticks butter looks a bit overwhelming yet adds great flavor and crunch to the finished bar. It took me about 10 minutes to put the crust together, and about 7 minutes total for the filling. I let my bars chill a little longer than the 1 hour. Next time I will use parchment paper to line the pan which will make removal of the bars from the pan much simpler. Easy breezy buttery goodness. I don't think I’ve ever baked anything that came together so seamlessly and quickly to produce such pure deliciousness. Of course, the Indian in me had to struggle to resist adding some ground cardamom to the crust. But the tartness of the raspberries, the buttery crust, and the hint of almond in the frosting are wonderful together. The zest of 1 lemon didn't impart much flavor or aroma. I would've liked a bit more citrus, perhaps even lime or key lime? Overall, a winning recipe by unanimous vote. It's foolproof so even non-bakers will gain confidence with this recipe. I piped using a resealable plastic bag). While the glaze added a nice finishing touch, the bars were plenty sweet without it, and I don’t personally strive for the look of the glaze atop the bars, so I’d be fine omitting it. However, I bet most folks would like theirs glazed, so I’m not sure I’m a trustworthy guide on this point. These bars are buttery and delicious, and the raspberry filling is bright and flavorful. I would invest in a pastry blender because it takes a lot of time and effort to cut in 3 sticks of butter using 2 knives. The leftovers were fabulous for breakfast.